Living in a Material World: A Win-Win for Improving Energy Efficiency? An 80-95% reduction in greenhouse gas emissions produced within the EU by 2050 from 1990 may sound impressive, but it is not the whole story, as we discuss in a new paper published in Climate Policy. There is more than one way to calculate national carbon footprints and the way emissions are currently counted casts EU countries in a favourable light. Climate targets focus on greenhouse gases produced within the EU, not those required to support the consumption of its residents. While emissions produced within the EU’s territory – by its factories, power plants, buildings, cars and so on – are declining, emissions driven by EU consumption are rising. Greenouse gases become embodied in products as energy is used, transforming raw materials into buildings, clothes, phones or cars. Some of these materials and products will be mined and manufactured abroad, and the EU imports more than it exports. As a result, the EU ‘consumes’ about 40% more emissions than it produces. In our research, we looked across the whole EU supply chain (including overseas territory) to see where greenhouse gases are expended in the materials, transportation, construction, use, disposal and replacement of everything from buildings and cars to furniture and packaging. We calculated how many of these emissions are included/excluded from existing EU climate policies and whether policies could be extended to capture additional emissions as materials are transformed into products. Cutting carbon along product supply chains can also reduce production costs, so addressing the full supply chain emissions could realise cost savings too. The EU’s Emissions Trading Scheme (EU ETS) is not doing enough to incentivise low carbon innovations in energy intensive industries and even if it was effective, the industries it addresses only produce 45% of the EU’s emissions. Alongside renewable energy targets, the EU’s climate package relies on energy efficiency measures to deliver its climate targets. Energy efficiency standards have made progress in reducing the energy consumed when using electronic goods, heating buildings and driving cars (i.e. in use). Yet this does not address all the energy needed to produce the EU’s homes, cars, phones, roads, food etc. Taking a closer look at buildi ngs and cars purchased by EU residents: the EU’s Building Performance Directive tackles the energy efficiency of buildings in use. However, an equivalent amount of the carbon used to heat buildings (i.e. in use) is used in their construction. 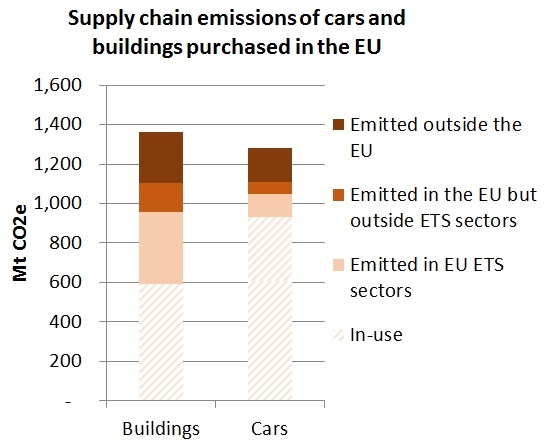 Whilst 30% of the supply chain emissions are produced in sectors covered by the EU ETS (mainly power and material processing sectors), and are arguably addressed by existing climate policies, 30% sit outside EU climate policy altogether. For cars, we can see that nearly three quarters of the supply chain carbon is emitted when driving (i.e. in-use) and subject to energy efficiency standards. All in all, however, 20% is left outside the scope of EU climate policy. This same analysis we have applied to cars and buildings can equally be applied to appliances, electronics, furniture, clothes, packaging etc. Their supply chains emit the equivalent of 40% of EU production emissions, with two thirds completely outside the scope of existing policies. Therefore there is significant potential for EU product policies to address climate change in this area. Energy efficiency regulations and standards could be extended to include embodied emissions. For example, the Ecodesign Directive, the EU’s tool to improve the energy efficiency of electronics and appliances, does have a mechanism to address some aspects of embodied emissions, including promoting easy to repair designs which would reduce emissions embodied in material use. However, this was introduced when embodied emissions data was sparse and of poor quality. Without mandatory material efficiency standards this has not been utilised. By addressing material efficiency alongside energy efficiency our research indicates that these measures can enhance the policy package for climate mitigation. There is however work to be done on designing the right policies to exploit these opportunities and this needs to be underpinned by a mainstreaming of knowledge of embodied emissions flows into policy, as well as research. In the ideal scenario we can provide a truer picture of the EU’s carbon footprint while simultaneously uncovering ways to substantially reduce it and save costs in the process.